Imagine losing every image you have ever taken of your child, your wife, a family member that has passed away, that beautiful sunset in Hawaii, all of your client’s images…you get the point. Are you feeling sick to your stomach, especially knowing it could have been prevented? The good news, it’s not too late. If you have more than 6TB of data, you need to invest in a RAID backup. Here are 5 common excuse people make for not buying a RAID Backup and 5 solutions to help you make the right choice. If you have less than 6TB of data, you can have a very affordable backup solution with just two 6TB hard drives–check out Building a Bulletproof Backup. But if you have more than 6TB, one hard drive isn’t going to cut it. You need a second drive plus a Backup for the second drive. Now you have 4 hard drives to manage not to mention you’re scattering data across the drives. This is what RAID (redundant array of independent disks) was created for. RAID combines multiple physical disk drive and manages them into a single logical unit. If a drive fails, you simply replace it without loosing data. 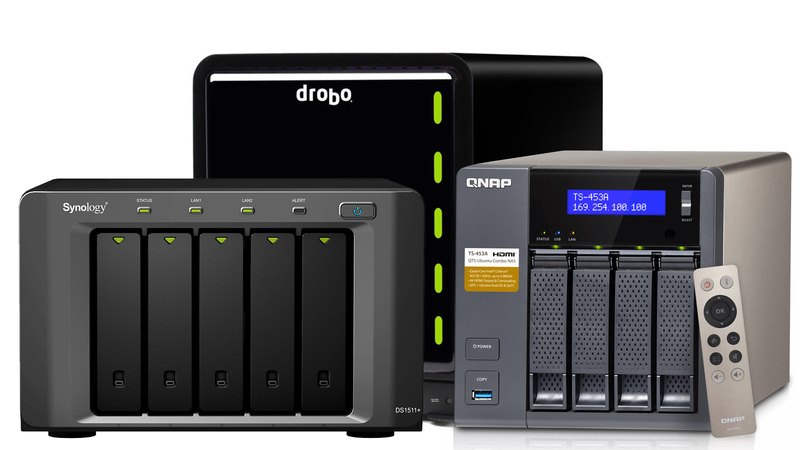 You could build your own RAID system–if you’re VERY knowledgeable with computers– or buy a NAS (Network-attached storage) product such as Drobo, Synology or QNAP that does it for you. Which one should you pick? That’s a personal preference. For me, I chose to invest in Drobo. I was sold on how they built their unit to grow as I grow. When I need more storage, I replace a smaller drive with a larger drive and Drobo takes care of remapping the new drive into the existing drive pack so I don’t have to. Hard drives are cheap, why can’t I just add another when it gets full? You could, but now you have data scattered across multiple drives. Trying to manage multiple drives along with multiple backups leaves lots of room for errors. The performance also suffers when a hard drive is full. The three NAS products I’ve mention, Drobo, Synology and QNap cost $344, $399 and $442 respectively. These units should be replaced after 5 years–about the same time you upgrade a laptop or desktop computer–bringing the cost of ownership to about $80 to $90 a year. Not bad, right? I know what you’re thinking, these units don’t come with hard drives and that’s an additional cost you can’t afford. The good news; at least for Drobo users, you can reuse the hard drives you already have! If you have four 4TB hard drives, install the two backup drives first and let Drobo initialize or format the drives. Copy your data from the remaining two drives, one at a time, to Drobo. Once it’s complete add that drive to Drobo. This is great for saving money, but I would recommend spending about $536.00 on 4 quality Internal HGST 4TB Deskstar NAS Drives that cost about $134.00 each. After your data is safely copied, use the old drives as backups until you save for another Drobo unit. Your total cost using all new drives is about $870.00. Peace of mind knowing your data is safe, Priceless. This is actually a good excuse but one that is easily fixed. Each of the NAS boxes I’ve mentioned has videos, written articles and a help desk to get you started. I would recommend setting up the new NAS with two new hard drives. Once everything is installed properly, start copying your data to the new unit. I know that sounds funny, but be honest, it’s true. Most people would rather buy a new lens or a new piece of gear instead of investing in the security of their data. But what good is that killer image you took using your new gear if it’s lost forever due to a hard drive failure? Invest in a RAID and keep your data safe. There are many reasons photographers put off investing in a RAID system, but they all end the same way: with priceless images lost forever on a hard drive that quit working. All hard drives will fail, but in a RAID system, the files are protected. You work hard to make the best pictures you can, and you owe it to yourself (and your clients!) to protect those pictures as much as possible. Get a RAID and get peace of mind. Please remember that RAID/NAS does NOT take the place of backup. It’s just redundant storage. Backup (if you’re gonna use that word the same way I do) needs to be physically separate (cloud, a relative’s house in another metro area, safe deposit box, etc). Check out Building a Bulletproof Backup explains the 321 Backup plan. If you have two RAID units locally and a third in the cloud, you’ll never have to worry about losing data. Local RAID makes it easier to replace drives and grows when you grow. I agree BACKUP has many meanings. An offsite backup such as Crash Plan or BackBlaze is a true BACKUP. Here we are talking about RAID being a mirrored backup of your main drive. I have a Drobo 5N but I have heard many horror stories, that when they go wrong, they go horribly wrong because of their proprietary file system. I also have issues opening files directly on the drive. So I am not 100% at peace with my backup system. I love their feature that not all the hard drives have to be the same size but i guess that is the payoff to being ties to their system.